PM Attorney graduates Leadership OKC LOYAL Program - Phillips Murrah P.C. Every year, approximately two hundred of Oklahoma City’s rising stars vie for a chance to be a member of Leadership Oklahoma City’s Linking OKC’s Young Adult Leaders (LOYAL) Program. Phillips Murrah Attorney Monica Y. Ybarra was selected to participate in this prestigious program as a member of LOYAL Class XII. 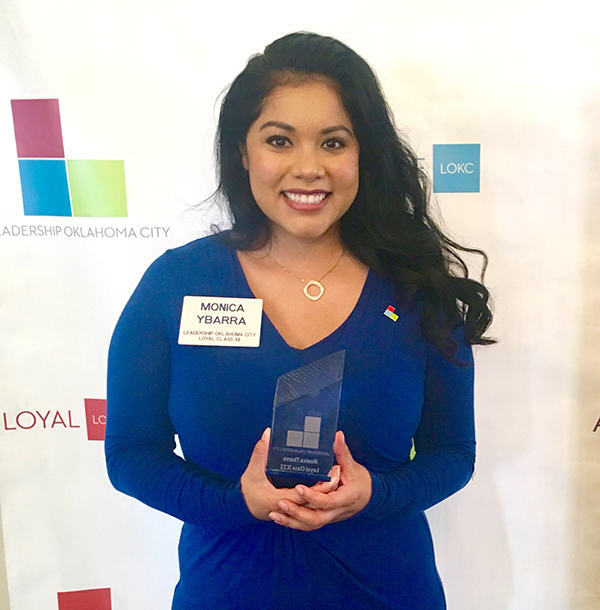 The Firm is pleased to announce Ybarra graduated from the program last week and is officially part of the Leadership Oklahoma City family. The LOYAL Program focuses on enhancing personal leadership skills and cultivating community leadership skills. During the seven-month program, participants have unique opportunities to learn leadership skills from Oklahoma’s most influential and accomplished business people, public servants, and non-profit managers. “Participating in LOYAL has been one of my most rewarding Oklahoma experiences,” Ybarra said. “The program offered me a chance to increase my leadership intelligence and connect to the community in so many ways. Participants gain insight into topics such as board skills, human resources, public speaking, non-profit finances, ethics, and much more. Additionally, Leadership Action Projects afford participants an opportunity to apply their skills and talents to tackle substantive issues in our community. Ybarra is a litigation attorney who practices family law. She represents clients in all areas of domestic and family law matters including, divorce actions, custody matters, guardianships, prenuptial agreements, and paternity actions. Other Phillips Murrah graduates of Leadership Oklahoma City programs include Jim Roth, Signature Program Class XXII, and G. Calvin Sharpe, Signature Program Class XXIII.